Students of Morgan’s House of Music, Moneymore have been congratulated on their outstanding results in piano, guitar, singing, violin and theory exams. The school had a 100 per cent success rate in practical music and the youngest student was just six-years-old Katie Wilkinson who gained a distinction in her first ever singing exam at grade three. Lois Cooke gained 100 per cent in theory, while 13-year-old Thomas Currie gained a level equivalent to grade six. There were a total of 76 successes in all with many students sitting up to four exams within the year. Among the successes were: Cassie Doyle, Conor Dougherty, Niamh O’Hare, Aislinn Kelly, Mass Carron, Nikki Vargheae, Maria McClean, Jodie Forsythe and Anna Amy. Those who reached grade on were Hannah Scullion, Micheal Conglomerate, Daragh Kelly, Ella Mcivor, Chloe Cassidy, Olivia Currie, Ella Neeson, Nikki Vargheae, Amy Loughran, Alena McKeown, Niamh O’Hare, John McGuckin, Laura McGuckin, Kelly Conklin, Sara McCaffery and Caleb Cuddly. Others were James McGuiggan, Laura Declined, Cara Neeson, Amy Delving and Katie Wilkinson. Grade two: Alena McKeown, Kevin McClean, Cara McClean, Ava Tierney, James Seymour, T Kelly, Paidraig Kelly, Kelly Common, Cara Neeson, John McGuckin, Laura McGuckin, Hannah Scullion, Olivia Currie, Aislinn Kelly and Michelle Campbell. Others were Rachelle Strip, Anna Smyth and Bronagh McIvor. 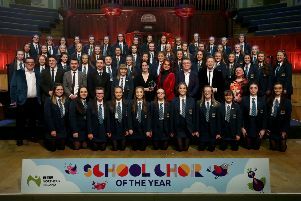 Grade three: Rebecca Ferguson, Lois Cooke, Harry Currie, Laura McGuckin, John McGuckin, Aislinn Kelly, Katie Wilkinson, Cara Neeson, Kevin McClean, Cara McClean, Michelle Campbell, Rachelle Stripp and Mary Therese Connelly. Grade four: Thomas Currie, Lois Cooke, Alana Wilson, Ciara Wilson. Grade five and: equivalent Mega Vargheae, Ciara Wilson, Alana Wilson, Kevin Loughran. Grade six A Level equivalent and UCAS points Thomas Currie, Mega Vargheae, Patrick Maguire. Grade seven Kevin Loughran and Alana Wilson. Grade 8 Rebecca Montgomery and Sasha Stuart.